However, the concept is catching up fast owing to a lot of reasons. Radhika Jumani, Co-founder and Head of Category, hoopos.com tells, “Convenience, doctor recommendations and increased international travel are the factors that are backing this industry.” The consumption and buying patterns will move a notch higher as people become more informed about these foods. International labels undoubtedly rule the industry both in terms of the number of brands and product assortment made accessible. 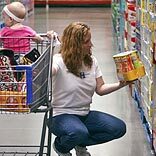 Gerber, Heinz and Enfamil are the highest selling brandS in the category. Nestle is one such Indian player in the space who has carved a niche for itself. Powdered milk is what the Indian labels specialise in while the international counterparts offer processed vegetable, fruits as well as non –vegetarian specialties. The choices range across the board predominantly for the rationale that the concept has been widespread in foreign lands for a long time. Since Indian labels do not offer variety, people have to pick up international products which come with a relatively higher price tag. The availability of processed baby foods is not so widespread at present especially for international labels. Though powdered milk is easily accessible, it becomes quite a chase to find food items. The high end supermarkets are where you can lay hands on these products but the concern that grips is the variety they stock. The grey market in India also shares the market share pie and does have a lot to offer to a customer. Online retail is what has made the product accessible for people especially those who do not have the time to run to malls every other day. The sale of processed baby foods online has added to the growth of this category as well. At Hoopos, about 100 units sell everyday while at FirstCry, an average of two to four per cent of the total sale caters to processed baby foods. FirstCry has on offer Enfamil, Enfrapro, Protinex, SMA, Heinz, Gerber, PediaSure, Pristine, Pedifill, SMA, Abbott, Nestle and Ensure while you can click and pick Nestle, Heinz, Gerber, Pristine and Enfamil on Hoopos. The potential for growth is immense as it is still largely untapped. Maheshwari reiterates, “It’s a big market and if the availability of the products becomes better in India, it would certainly increase in a big way.” Brands already a part of the baby industry, can extend their portfolios to cater to this segment which will help create them to create a slot for themselves and add to their sale numbers.